On July 27, 2018, thanks to President Trump’s “America First” economy, GDP soared to 4.1 percent for the second quarter of 2018, outpacing the first quarter, in which GDP was 2.2 percent. During a panel discussion with a local chamber of commerce in 2013, House Speaker Paul Ryan said mass legal immigration through Rubio’s 2013 amnesty was necessary to fill the U.S. with workers and increase economic growth. RYAN: And we believe in economic growth. And when we’ve got baby boomers retiring, when we’ve got 10,000 people retiring every day as they will be for 10 years coming, we’re going to need people. And when I look at this from just an economic standpoint, our birth rates are pretty [low] compared to our peers around the world, but they’re not where they need to be. Immigration will help improve that so that we have the labor we need to get the economic growth that we want so that America can be a fast-growing economy in the 21st Century. Immigration helps us get the labor force that we need so that we can have the kind of growth we want. In 2013, CNN’s Fareed Zakaria dedicated an entire segment to pushing the idea that mass immigration through Rubio’s “Gang of Eight” amnesty is a “simple way” to grow GDP in the U.S. The media outlet ProPublica, which is funded by left-wing billionaire George Soros, touted their research on immigration and GDP last year. The report claimed that the easiest route to achieving four percent GDP under Trump was by importing ten million foreign nationals every year, a drastic increase of legal immigration to the country. 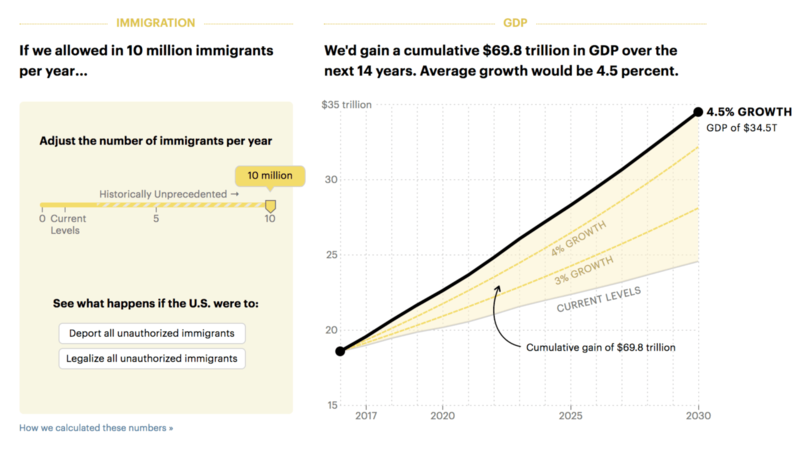 Months ago, senior editor of The Atlantic Derek Thompson wrote that increasing GDP could be done under Trump, but that increasing legal immigration levels was how it could be achieved. In its attempt to push Rubio’s mass immigration and mass amnesty “Gang of Eight” plan, the Wall Street Journal released a report in 2013 in which it claimed that “faster economic growth” would be achieved if the U.S. allowed more legal immigration. The executives of the Hoover Institute released a similar 2013 study pushing Rubio’s amnesty plan in which they claimed that increasing GDP could be accomplished, but only if the U.S. imported more H-1B foreign guest workers to take high-paying white collar U.S. jobs. Billionaires Rupert Murdoch and Michael Bloomberg’s open borders lobbying organization, the New American Economy, advocated in 2013 for Rubio’s “Gang of Eight” amnesty, claiming their own study found that it was necessary to boost GDP. “Our estimates found that benchmark immigration reform would increase GDP by nearly 1 percentage point,” the New American Economy report stated. “Included in the estimate were projected changes to the size of the economy (GDP) over the next 11 years,” the report continued. “The Chief Actuary estimated that by 2024 the level of GDP would be 1.63 percent higher than would otherwise be the case and by 2023, the end of the current 10-year budget window, GDP would be 1.6 percent higher than would otherwise be the case.